I’m still unsure if these guys are going to play separately and together, or if Junior Brown’s gonna play with the Reverend and Big Sandy with The Blasters. I mean, The Blasters have a fine vocalist in Phil Alvin, but maybe Phil and Big Sandy have some vocalizing together planned. I’m sure they do, even if everyone’s gonna do their own sets, there’s gotta be some jamming, right? And from the billing, it looks like it could be Rev HH and Junior Brown together, which would be amazing, but so will separate sets. Either way, it’s gonna be a great night of music! 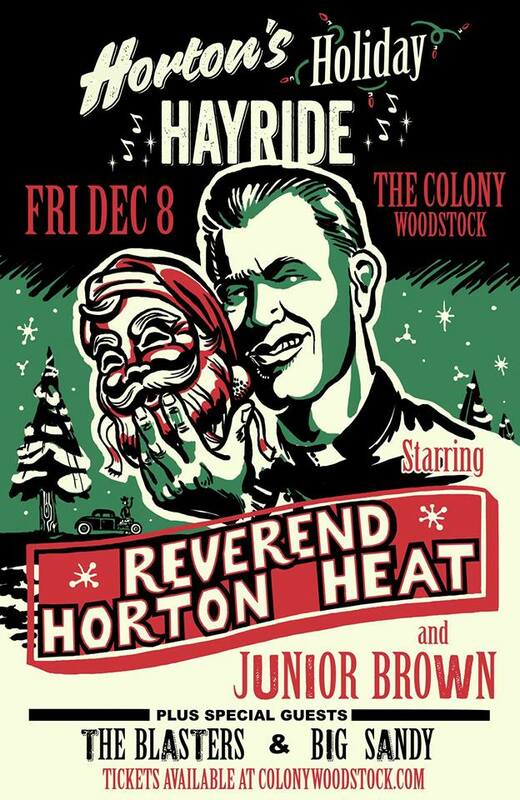 I first heard the Reverend Horton heat when my buddy, Hank III toured with him years ago. Great Rockabilly artist. The last time Junior Brown played the Bearsville Theater, every guitar player in town was there with their heads shaking and their jaws on the floor! Nuff said! The Blasters are one of the best Rock n Roll bands to surface in the post-1980s era, and for my money, one of the best of all time. They won’t have their regular lead guitarist and main songwriter, Dave Alvin, Phil’s brother, with them at Colony, but I’m sure his replacement will rock with the best of ‘em, and the songs are Blasters songs, no matter who wrote ‘em, and BTW, Dave is one of the best songwriters we have, and you’ll be hearing those songs at Colony tonight! And finally, Big Sandy, of Big Sandy and the Fly Rite Boys, very cool band, and Big Sandy has been known to tour with another amazing band, and a personal favorite of mine, Los Straitjackets, so maybe he’ll be doing the same gig with The Blasters, who knows? Anyway you slice it, it’s gonna be a long long time before the magnitude of this bill is topped in Woodstock again!!! Colony Woodstock, Friday, December 8, doors at 6. Show at 7. I don’t wanna end this without a short plug for the Hudson Valley’s newest music store, Kingtone Music, 282 Main Street, in Saugerties. Owner, Alex Kellner, a 30 year veteran of the retail music business, has done a fantastic job of cramming his small space with gobs of the best musical gear on the planet!!! Alex knows what he’s doing, and has vintage Fenders, Gibsons, and Gretsches, as well as brand new D’Angelicos, the best drum kits, vintage amps, and all sorts of cool gear that you need! Go check him and his lovely wife, Patty, out at their Saugerties location. You’ll be glad you did!! !